This is an intelligent, engaging, and most importantly, a sympathetic approach to dealing effectively with drug addiction by combining the holistic approaches of traditional Chinese medicine and energy healing techniques. 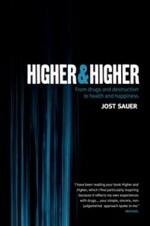 Higher and Higher offers a fresh perspective on the effects of drugs such as marijuana, speed, ecstasy, cocaine and heroin, as well as the very human need to feel good. It then goes on to present safe, healthy, and drug free ways to achieve an even more intense and pleasurable high - based on techniques from Chinese medicine and energy healing methods such as Reiki. This is a must-read volume for anyone who wants to enjoy life and experience the ultimate high - in a totally healthy, holistic, and drug free way.